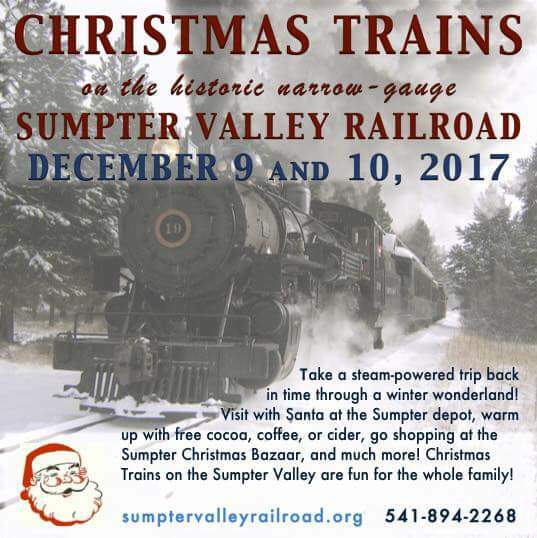 Christmas is truly a wonderful time of year to visit Baker County Oregon, and see for yourself why two of our local communities, Sumpter and Baker City, are among the “Most Enchanting Christmas Towns in Oregon”. And, for Christmas shopping, Baker City’s downtown is one of “8 Main Streets that are pure magic at Christmas Time”. Christmas is a festive time of year and December in Baker County is full of small town celebration’s festivals, and special events celebrating the holidays with small town charm. This festive three day celebration includes the special preview of the trees on Thursday November 30th, Auction gala on December 1st and a full day of family fun on Saturday December 2nd with pictures with Santa hosted by the Baker City Kiwanis club, and the ever popular “Make it and Take it” Christmas Crafts with Crossroads Carnegie Art center. A perfectly picturesque Christmas outing, dashing through the snow along the Elkhorn Scenic Byway on a historic steam train on your way to see Santa.